This is the painting that calls me continually, that prompted me to respond with some writing. It's part of the permanent collection at the MoMA, and since the opening of the new building, to my knowledge it hasn't moved. I know this because of an aesthetic radar that leads me to this painting each time I visit the galleries. I go right through multiple rooms of Picasso, bee-lined to this great work. 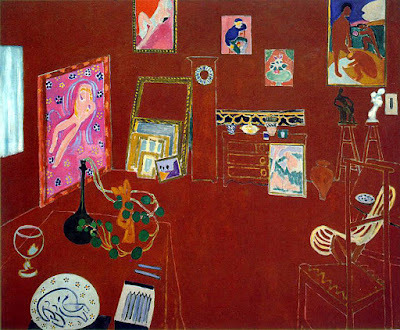 So much of Matisse's work illustrates the figure and great fabric patterns draped across the composition. But this is just a space, a work space. And it's red. So many connotations for me, an artist educator who is passionate about process. And the painting is large. As I stand in front of it time after time, I imagine stepping right into it and looking around, just like Mary Poppins and the sidewalk chalk drawings.